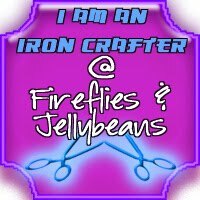 I've been racking my brain trying to think of something original to make for the Fireflies & Jellybeans Iron Crafter Challenge. The secret crafting ingredient for this crafting throw-down was "knobs and hinges". In the interest of not boring you to tears on a Friday afternoon, I will refrain from telling you the perfect storm of reasons why the craft that I am about to show you is THE PERFECT CRAFT--for me, for the Iron Crafter Challenge, for my blog, for my kids, and for this day. But it is INDEED, perfectly right for right now. -6 different items that make distinct and interesting sounds. I used: pennies, rice, a large jingle bell, a glass marble, dry oats, small wooden beads. Whatever you decide to use for your "sounds", make sure you have double of each item. Step 1 - Flip your boxes over and color code them. Do this by placing a dot of paint directly on the center of the bottom of each box using all six paint colors. You should have two boxes of each color dot when you are finished. This will allow the child to check their sound matches as they play. Let the paint dots dry, while you play with power tools. Step 2 - Measure your lids and mark the center using pencil. Then drill holes in the center of each lid. Step 3 - Apply wood glue to the knobs and insert them into the holes that you drilled in the lids. Wipe any excess glue with a paper towel. Allow glue to set. Step 4 - Fill your boxes with the sound-making items of your choice, being careful not to mix up the color coding. I filled and glued two boxes at a time, checking the color dots as I went. Note: During this step, you might also want to make sure that the sounds are distinct enough for your game. You can always swap your items out for something else during this step, but not after. Step 5 - Apply wood glue to the rim of each box and glue the lids on. When the glue has dried, arrange the boxes on your tray and play! Because of the nature of this game, I decided against embellishing the outsides of the boxes in any way. Since it is a matching game that relies on listening, flashy designs would have just been a distraction. With this game, the treasure truly is inside...and the beauty is something to be heard and not seen! That said, I think that the natural wood is elegant in and of itself. Ok, are you ready to see it in action? 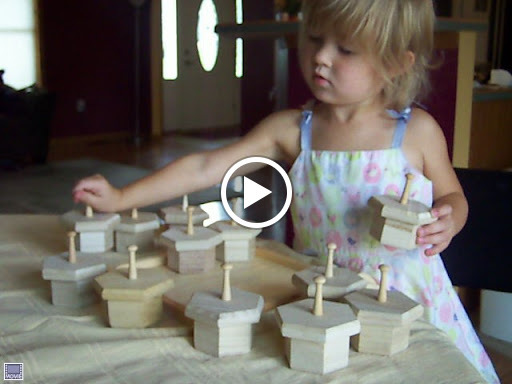 Here are two videos of my kid-testers, ages 3 and 8, playing "Shake, Rattle & Match"! This is my first crafting challenge, and I am excited to say that I am now an Iron Crafter! Click on the button below to check out what others have created using knobs and hinges. you are having way too much fun...good job! This is so fun! What a creative idea! WOW! THat is a very cool idea! Great job. Super creative! I know who I'm voting for!!!! I especially LOVE the videos of your kids playing. So cute! I love this idea! Lots of learning going on! Such a classic, entertaining toy! My kiddos would love it! I love the fact that there's noise....children and I love noise and this is perfect. WHat a fun, creative game. I love it! I love this idea, good job, will pass it along to my friends. You made the top 10 in the Iron Crafter! What an awesome game! I am headed to the craft store as we speak for the supplies! Congrats on the top 10 too! And this could be marketed for the visually impaired or children with sensory issues...Great idea!!!!! What an awesome idea. You're totally wasting the competition. Good work.